A good day for dancing the greys away. It was too dull a day for taking the Juke round the top end, so we just drove through the rain down to Portree, the big city. We headed for Jan’s Vans. A real find in Portree. Jan’s Vans is really just a big hardware store. Nothing fancy, but everything from a needle to an anchor. I’ve never actually seen any anchors in there, but I’m sure if you looked long enough you’d find one. We really were there for lunch, because it’s decent grub. Certainly not anything fancy, just good food. After lunch we went for a look round the shop part of the establishment and found lots of interesting and cheap stuff. Laces for my dancing shoes, memory foam insoles for the same. Bottle brushes that Scamp had been searching for everywhere. We passed on the ride-on mower for £2400 because it would be difficult to get it home. I suppose we could have ridden it, but it wouldn’t have been a comfortable journey. We had a look in Skye Batiks to see if they’d any nice shirts. They did have, but not at a nice price. £50 for a short sleeved shirt is a bit expensive for me. A quick trip to the newsagent’s and that was it for Portree. We headed back up the road through the rain showers. Scamp had arranged with her sister that we could book the hall in her outdoor centre for an hour or so of dance practise. 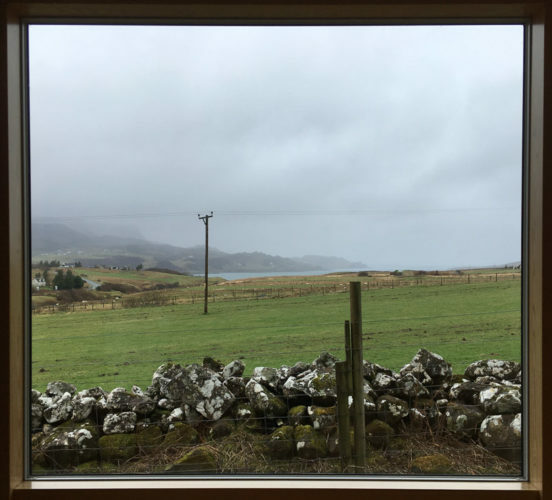 It was indeed a good idea and we got some useful dancing practise in and I grabbed PoD which was taken from one of the windows onto the wild Skye landscape. Back home and after dinner we had a fair bit of excitement when the chimney in the house caught fire and the fire brigade had to called. As it’s a volunteer group the men had to be assembled and driven up to the house in their brand new fire engine. It didn’t take much more than fifteen minutes and the fire was out by the time they arrived, but it was quite a worrying time. The guys were really efficient and put everyone’s mind at rest when they checked the chimney and the wall with their heat sensitive camera. Later we managed to settle down with a G&T for some and a dram for others to calm us down. It will be talk of the township tomorrow. Tomorrow we’re hoping for better weather and less excitement.